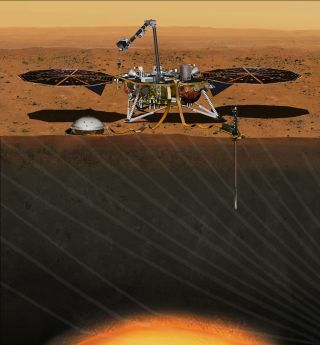 Artist's illustration of NASA's InSight lander on the Martian surface. InSight is now scheduled to launch on May 5, 2018, after a two-year delay. NASA has decided to save, rather than scrap, a robotic Mars mission that missed its launch opportunity this month. "The science goals of InSight are compelling, and the NASA and CNES plans to overcome the technical challenges are sound," John Grunsfeld, associate administrator for NASA's Science Mission Directorate in Washington, D.C., said in a statement. "The quest to understand the interior of Mars has been a long-standing goal of planetary scientists for decades," Grunsfeld added. "We're excited to be back on the path for a launch, now in 2018." If all goes according to plan this time around, InSight — whose name is short for "Interior Exploration using Seismic Investigations, Geodesy and Heat Transport" — will launch on May 5, 2018, and arrive at Mars on Nov. 26 of that year. Once there, the lander will use two main science instruments to study the Red Planet's interior, gathering information that should shed light on the structure and formation of rocky planets in general, NASA officials have said. One of InSight's instruments is a heat probe designed to hammer itself up to 16 feet (5 meters) underground. The other is the Seismic Experiment for Interior Structure (SEIS), a suite of three seismometers designed to measure subsurface activity on the Red Planet. The launch-delaying problem lies with SEIS, which requires a vacuum environment to make its superprecise measurements. NASA and CNES announced in December 2015 that the spherical vacuum chamber around the instrument was leaking; the problem was traced to a defective weld. NASA's Jet Propulsion Laboratory in Pasadena, California, will build and test a new vacuum chamber for SEIS, whereas CNES will be in charge of integrating the instrument with the chamber, agency officials announced today. "The shared and renewed commitment to this mission continues our collaboration to find clues in the heart of Mars about the early evolution of our solar system," Marc Pircher, director of CNES' Toulouse Space Center, said in the same statement. It's unclear how much the two-year delay will end up costing; NASA officials said they will likely come up with an estimate by August or so, after arrangements have been made with launch providers. The cost of the InSight mission was originally capped at $675 million, and $525 million of that has already been spent, Jim Green, head of NASA's Planetary Science Division, said in December, when the agency announced that the lander wouldn't get off the ground this month. The news about InSight comes less than a week before the European and Russian space agencies plan to launch the first phase of their ExoMars mission: A methane-sniffing orbiter and a landing demonstrator are scheduled to blast off on March 14 from Baikonur Cosmodrome in Kazakhstan. Phase two of ExoMars involves launching a life-hunting rover in 2018.